Happy New Year’s Eve! Who’s ready for the new year?! I’m definitely looking forward to next year! We are having a small party, just us family that normally get together every other weekend. This week is my sister’s turn to cook and I’m bringing dessert. 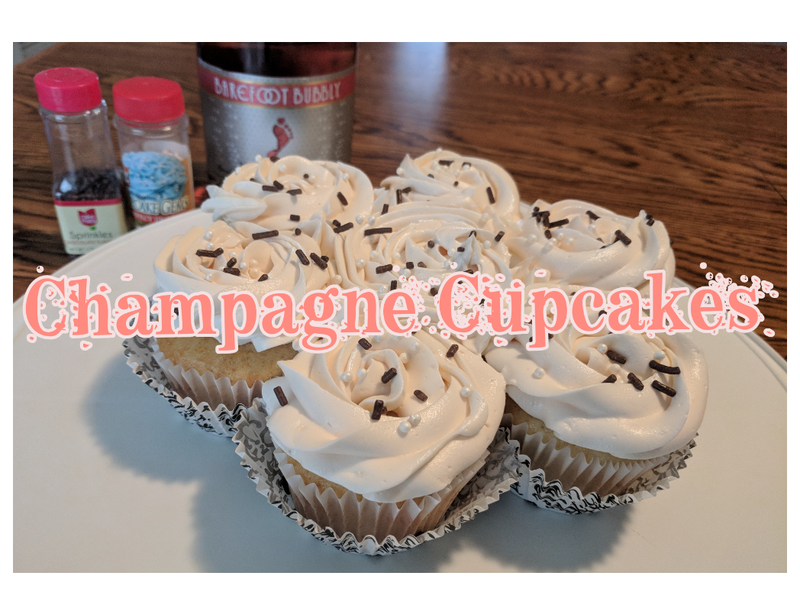 I wanted to do champagne cupcakes and found a few ideas on Pinterest. I combined them for our dessert today. The cake part is pretty easy. Get a box of Betty Crocker’s White cake mix and a bottle of champagne. I used Barefoot Pink Moscato. Follow the directions on the back of the cake mix, but use the champagne in replace of the water. Super easy! I didn’t have time to make the cake from scratch. Put 1 cup of champagne in a small saucepan and simmer over medium-high heat until it reduces to 2 tablespoons. Transfer to a small bowl or cup to cool. In a bowl, whisk the softened butter and powdered sugar together until it’s creamy. When the frosting is thick and fluffy, pour in the reduced 2 tbsp of champagne plus 1 tablespoon champagne from the bottle and mix well. 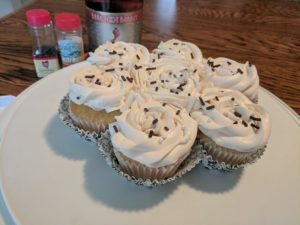 I used Wilton tip 2D to frost the cupcakes and immediately added chocolate sprinkles and pearl sprinkles.